Welcome to Holiday Side Dish Week! I’m joining up with some other bloggers this week to share a bunch of side dish recipes perfect for the holidays. We will be posting on Monday, Wednesday, Friday, and Sunday this week so make sure you come back all four days to enjoy the delicious holiday side dish recipes shared by nineteen amazing bloggers! There’s quite a variety of recipes and you can be sure to find something yummy to add to your holiday table. I can’t even tell you how perfect the timing of this event is! I mentioned it the other week, but a lot of my older recipes didn’t come over when I converted from Blogger to WordPress. Unfortunately most of those recipes were holiday ones that I had shared with you. So getting to make them again for this event and having them back on the blog in time for Thanksgiving is absolutely perfect. Do you call it stuffing or dressing? There seems to be two determining factors as to how you refer to this dish. The first one is where you are located geographically and the other is whether or not you serve it inside the bird. The Mid-Atlantic states call it stuffing, regardless of how it is served, and I fit into that category. Dressing is what you put on a salad. At least in my head. 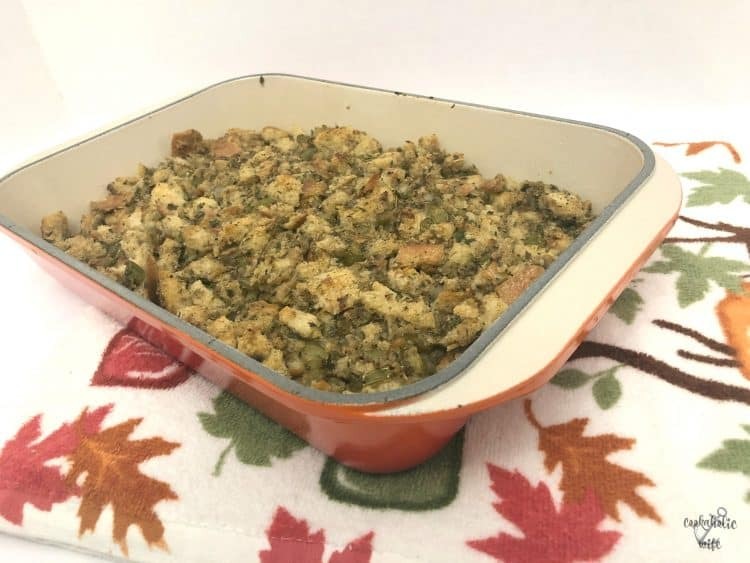 It wasn’t until I started looking up other recipes for stuffing that I learned that the version I had growing up was considered an old-fashioned version. Although, it makes sense. My mom made the recipe and my grandmother likely did as well. I’ve tried a bunch of different kinds of stuffing, but none of them are as good to me as a version that uses celery and onions. 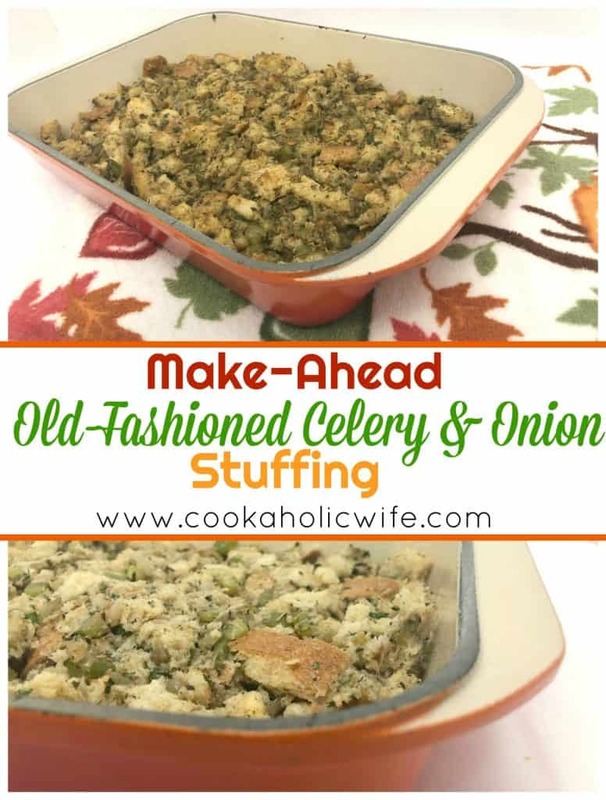 It adds so much more flavor to what is essentially bread, seasoning and stock so I really think celery and onions should be included in every stuffing recipe. 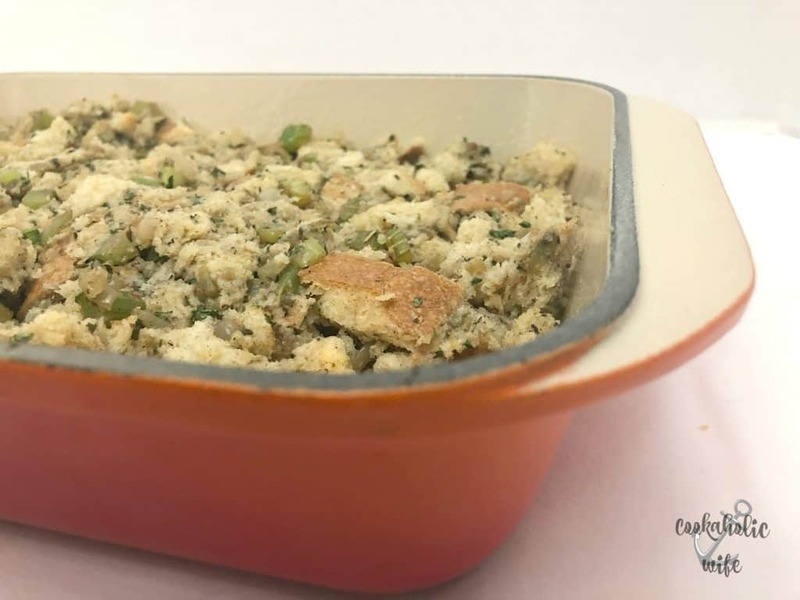 Old Fashioned Celery and Onion Stuffing uses only a few ingredients and a handful of herbs but packs in a bunch of flavor. This recipe can be made-ahead and frozen. Spray a 9×13 baking dish with non-stick cooking spray. Set aside. Add the onions, celery, sage, rosemary, thyme, salt and pepper and cook for 5-7 minutes or until the celery and onions are softened, but not mushy. Remove from the heat and allow to cool. Meanwhile cut the bread into 1-inch cubes and place in a large bowl. Once cooled add the celery and onion mixture to the bowl, along with the stock. Mix the ingredients together by hand. Transfer the stuffing to the prepared baking dish and sprinkle fresh parsley on top. Bake for 30-35 minutes or until golden and slightly crispy on top. Serve hot. *If you do not have stale bread, place whole slices of bread into the oven at 350 for 5 minutes, then cut into cubes. *White bread can be replaced with any type of bread you like. *To make ahead: use a 9×13 Pyrex dish with a lid. Prepare stuffing through step 5 and place into the baking dish (skipping the parsley). Cover with plastic wrap and the lid and freeze for up to 2 weeks. *To cook from frozen: thaw stuffing in the fridge for 24 hours. Allow to sit on the counter for 1 hour to come up to room temperature. Add 1/4 – 1/2 cup of stock if the mixture seems very dry. Add the parsley and cook for 30-35 mins. When hosting a holiday like Thanksgiving, where a ton of time goes into making the food and then it all seems to disappear from the plates of your family and friends in minutes, recipes that you can make-ahead are key. As long as you can spare a baking dish and the freezer, space, you can get this recipe ready up to two weeks in advance, saving you precious time on the morning of Thanksgiving. Simple and classic this stuffing recipe will please any of your guests! This is the base for my stuffing as well and it also came from my Mom however, I have tweaked it quite a bit since I first got married in 1974. 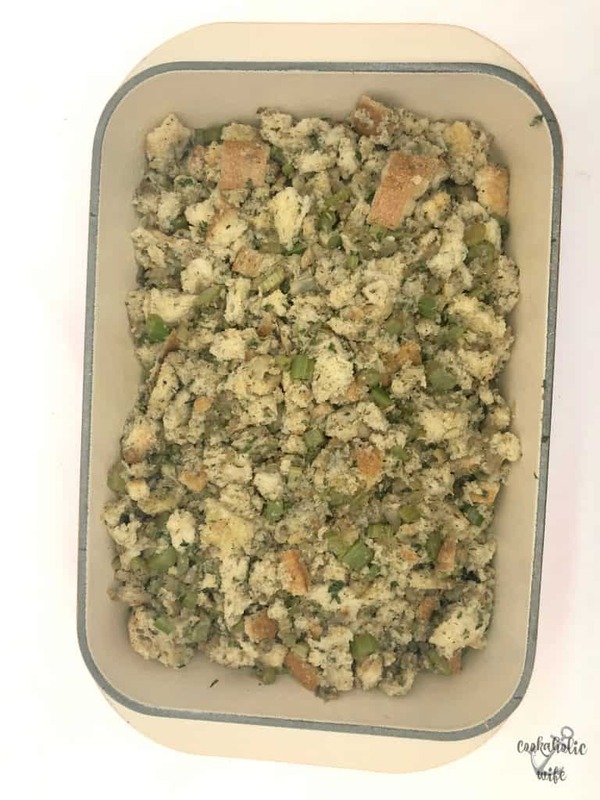 A simple old-fashioned stuffing. So good! Make-ahead recipes are always a must when it comes to Thanksgiving and not going insane! This stuffing looks rather delicious as well! Classic is definitely best sometimes, I think! There is something so comforting about family recipes that have been passed down 🙂 Your stuffing sounds so simple to make and delicious!